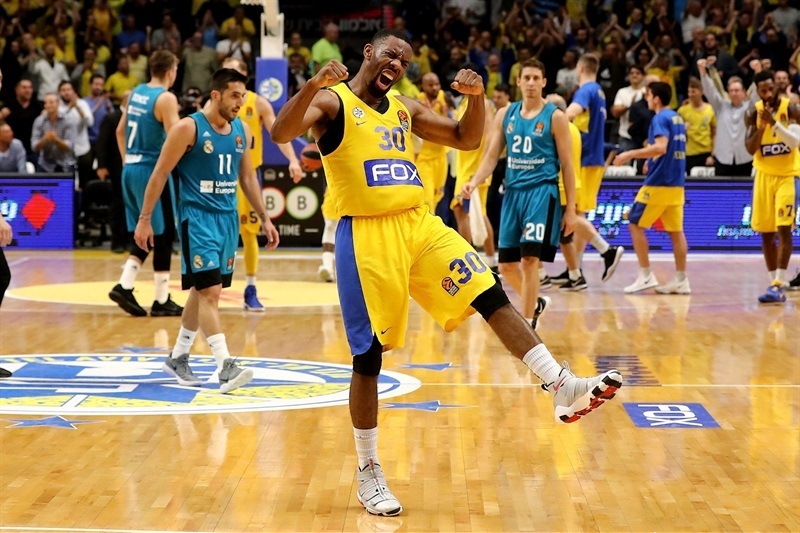 Menorah Mivtachim Arena was rocking on Thursday night as Maccabi FOX Tel Aviv bested Real Madrid 90-83. 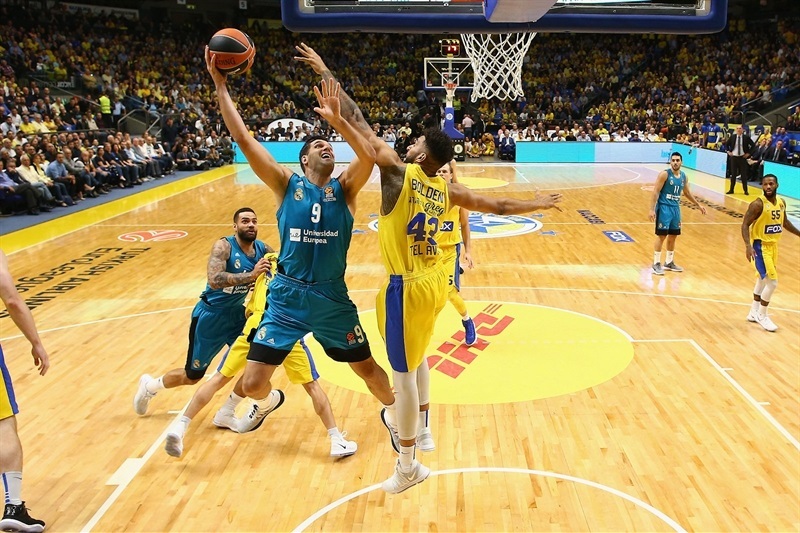 Maccabi dominated inside and set a new club records with 53 rebounds and 22 offensive rebounds, while outrebounding the visitors by 20. 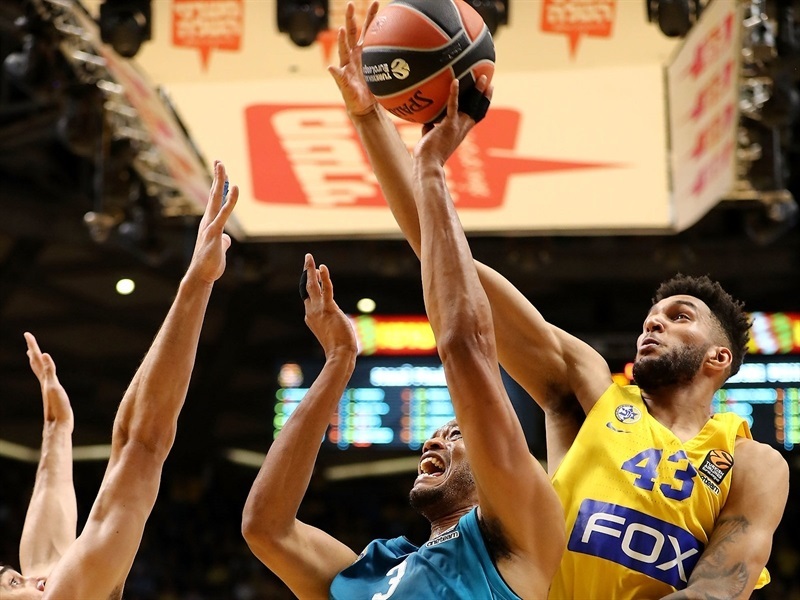 The result lifted Maccabi to 4-2 and dropped Madrid to the same record. DeShaun Thomas paced the winners with 21 points and Michael Roll scored 16, including 12 in 22-4 second-quarter run that put the hosts up 47-38. Alex Tyus added 14 points, Pierre Jackson 13 and Norris Cole 10. 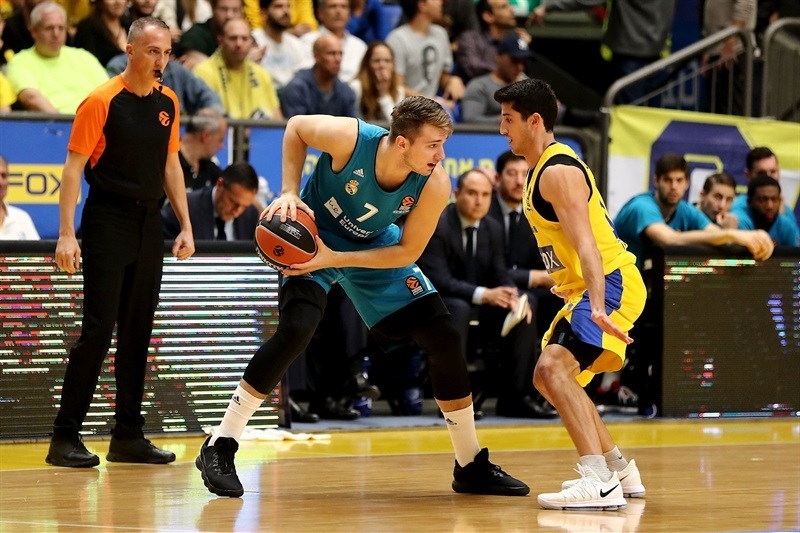 Luka Doncic produced 19 points and 6 assists for Los Blancos, who wore blue uniforms on this night. 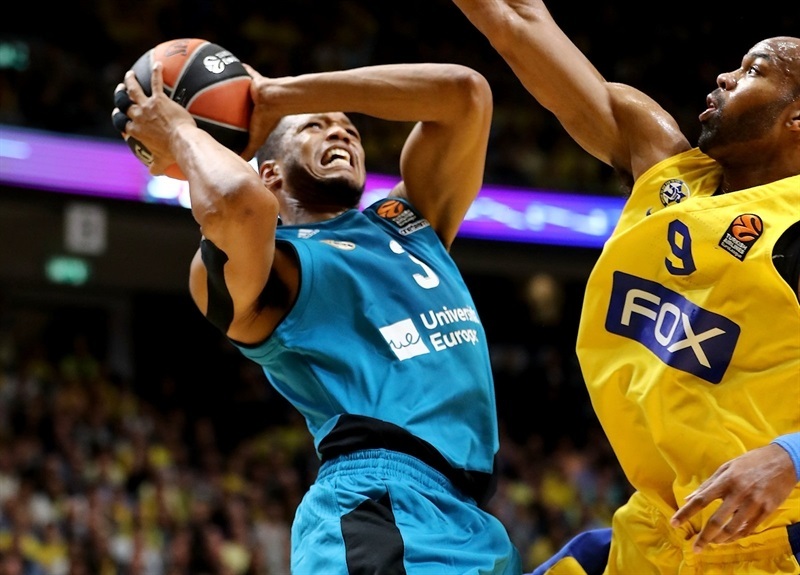 Anthony Randolph contributed 13 points and 9 rebounds and Felipe Reyes and Facundo Campazzo scored 12 each in defeat. 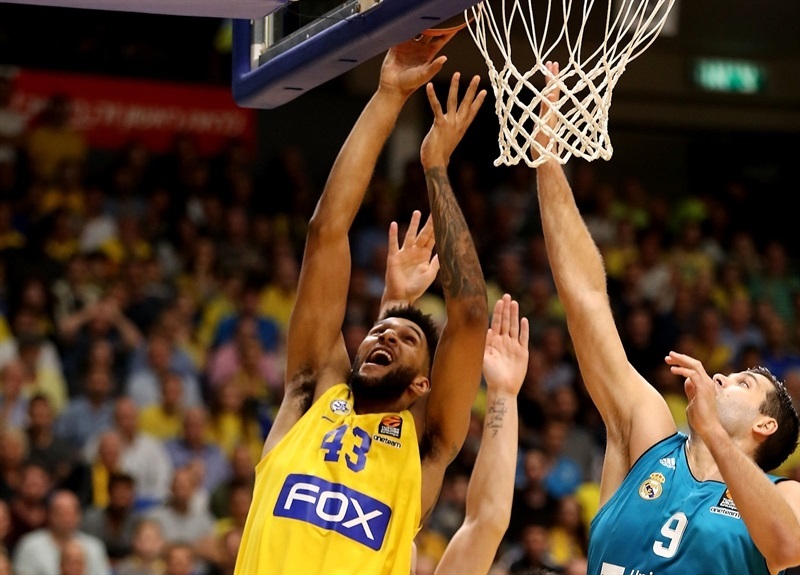 Doncic pulled the trigger from deep to open the scoring, while Jonah Bolden scored the first three buckets for Maccabi – including a pair on the offensive glass. 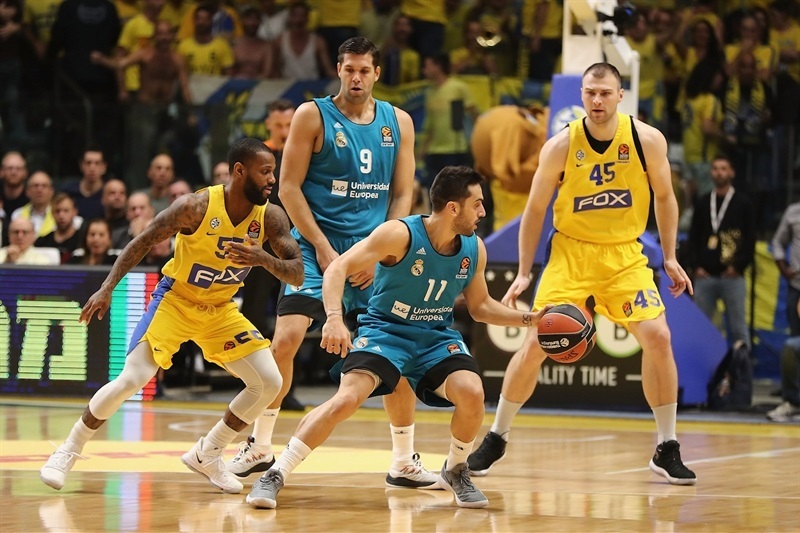 The visitors led 9-17 after Campazzo sank a jumper and made 3 free throws and Rudy Fernandez came off the bench to drill a triple. 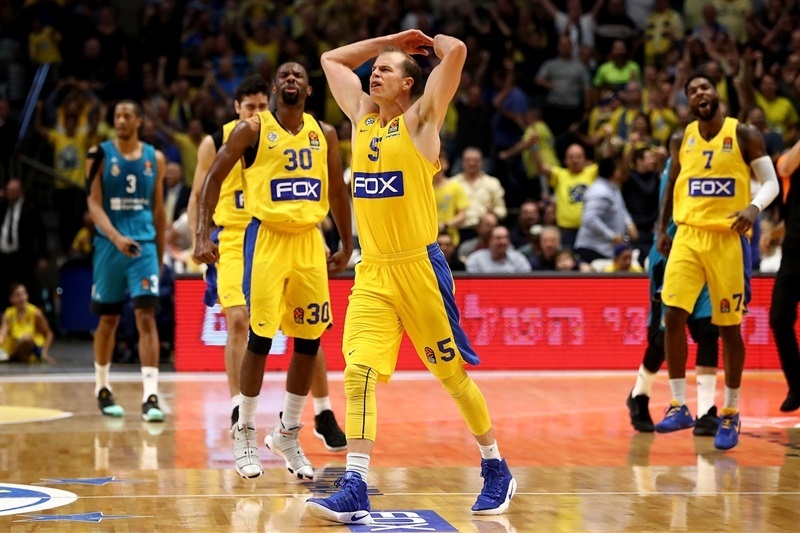 Thomas halved the Maccabi deficit, but the hosts had no answers on defense. Rudy sank a three to give Madrid a 10-point lead before Jake Cohen beat the buzzer with a hook to make it 22-30 after 10 minutes. Roll hit a jumper and a three-pointer to get the crowd engaged at 32-34. 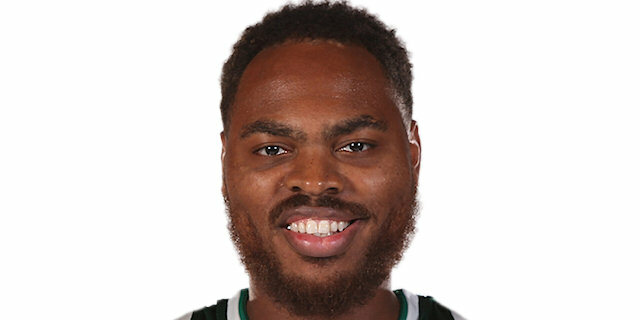 Thomas tied it at 38-38 with a basket inside and then Roll banked in the go-ahead score and drilled a three in transition to continue the Maccabi momentum in what became a 22-4 charge. 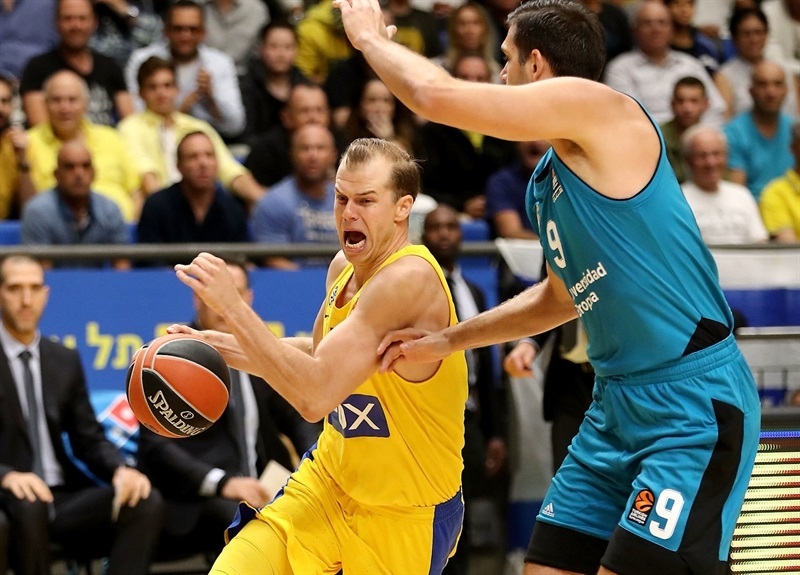 Randolph ended the Madrid drought with free throws and Doncic scored too to bring the visitors within 47-42 at the break. 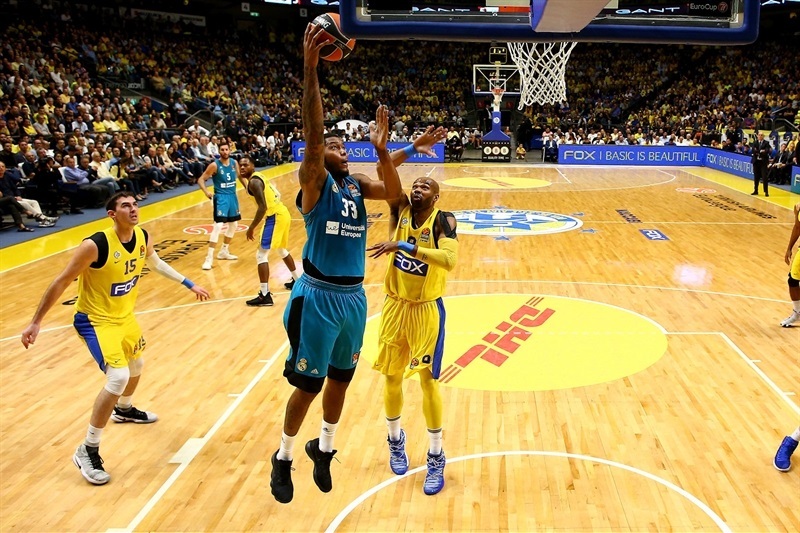 A Jackson three-pointer and another Bolden tip-in pushed the Maccabi lead to 8, but Bolden was soon on the bench with 4 fouls. Reyes kept Madrid close and then Randolph and Trey Thompkins stepped up in a 1-12 run that put the visitors ahead 60-64. Norris Cole’s jumper made it 64-66 through three quarters. Tyus’s dunk tied the game with the first basket of the fourth quarter, but Jaycee Carroll had Madrid right back on top with a three-pointer. However roll scored twice to put the hosts in front and Thomas netted the next two baskets to make it 74-69. Doncic was fouled shooting a three-pointer and Maccabi Coach Spahija was called for a technical foul. Doncic made the ensuing 4 free throws and then drilled a three-pointer for a 74-76 Madrid edge. The lead went right back the other way and Jackson’s basket-plus foul put the hosts up 83-78. After a timeout, Campazzo tripled, but Doncic missed from downtown with a chance to take the lead and Tyus turned an offensive rebound into a three-point play with 92 seconds remaining and Jackson iced the win with a layup. "We played very good basketball, except the beginning of the game. They made some threes; they have quality. Third quarter we had the early bonus, it is very difficult to play defense against such an experienced team when you are under the bonus. At the end of the day we found a way. In the last quarter we played excellent, smart. We had a lot of balance, inside outside. Pierre made some threes. " "I think we played tonight our best game since the beginning of the season. Amazing effort, not only quality. 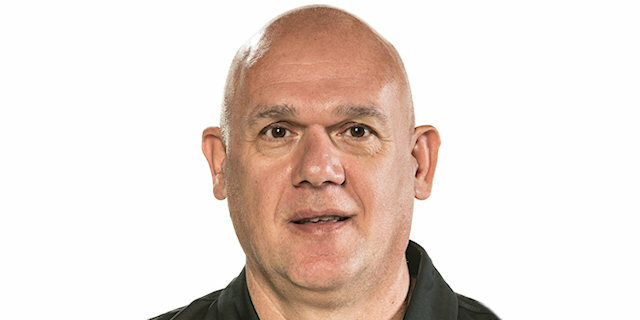 If you take 22 offensive rebounds, 53 rebounds altogether, it means something." "Congratulations to Maccabi for the victory. They played with a lot of energy. They were able to stay in the game for 40 minutes and get the win on two good runs – one in the second quarter and one in the fourth. For us, it is very simple: if you lose 22 rebounds in your basket and you shoot twenty-something percent from the three-point line, most of them open jumpers, it is very difficult to win. If you just see this and watch my team how they fight for the whole game, you have two options: saying that it was a [expletive] game, or give the value of fighting for 40 minutes with those situations. " "This means a lot. We worked really hard for this. This lets us know that we can play with anybody. This game was a test for us to know who we are. I know after this game we turned a lot of heads. I think we kept our composure as a team and we played really hard. "